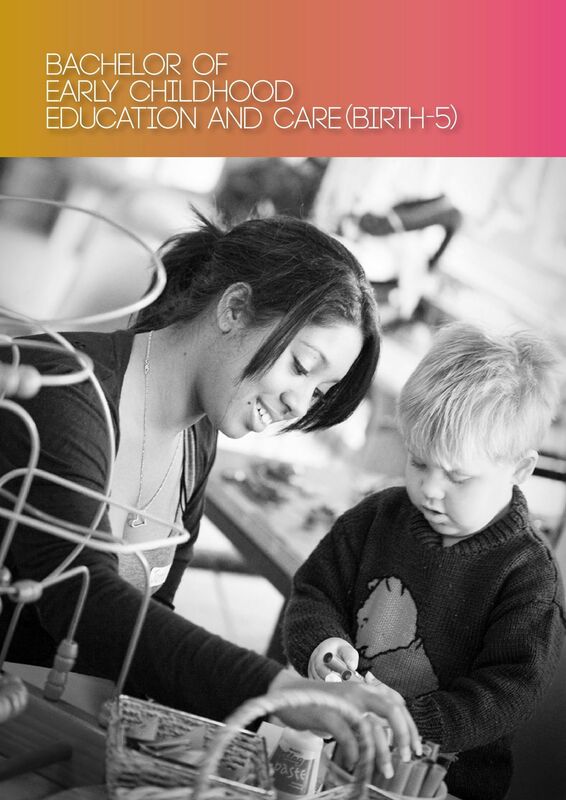 Download "Bachelor of Early Childhood Education and Care Birth 5"
4 A unique course design Career Opportunities This professional teaching degree qualifies you to work as a: teacher or Director in preschool teacher or Director in long day care or to be employed in: integrated child and family services early intervention services The TAFE NSW Bachelor of Early Childhood Education and Care (Birth-5) is a new concept in early childhood teacher education. 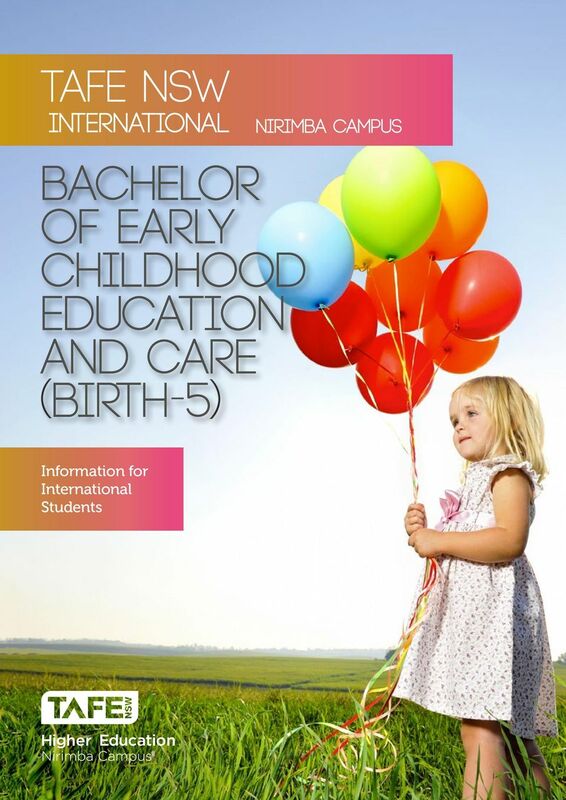 This course offers: An opportunity to gain a bachelor s degree plus a Diploma of Children s Services/Early Childhood Education and Care as part of the degree Small tutorial class sizes High number of work placement hours Expert teachers who have strong ties with the profession A minimum 12 months credit for graduates of the national training package Diploma of Children s Services/ Early Childhood Education and Care Extensive academic support built into the degree program Internship options in the fourth year. 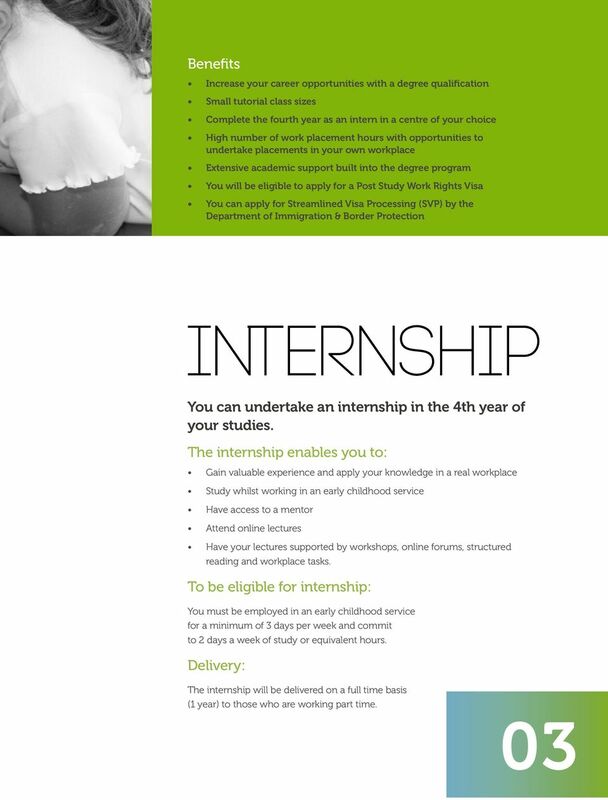 02 Broaden your career opportunities with a degree that gives you maximum exposure to the work place. 6 How to apply? 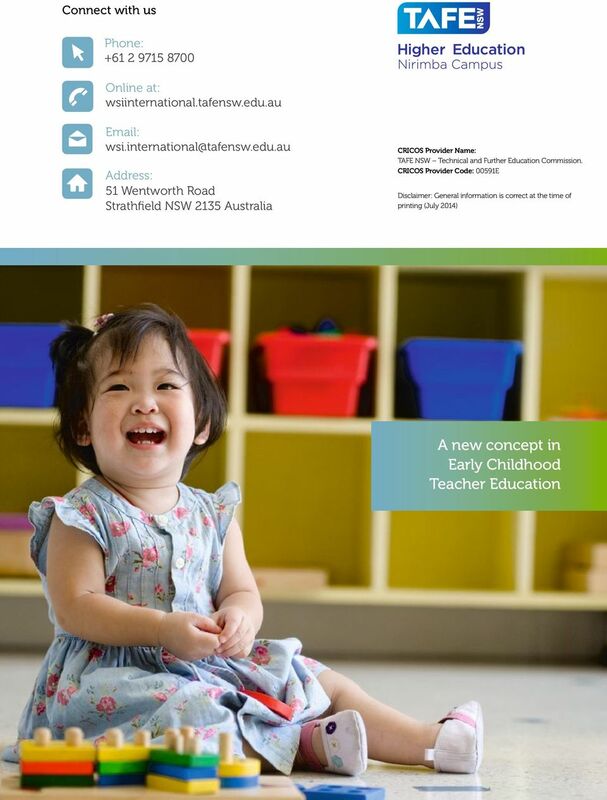 Details for international students Download and fill in the TAFE NSW Higher Education International Student Application Form and follow the Steps to apply wsiinternational.tafensw.edu.au/international-students/ how-to-apply/ Qualification: Bachelor of Early Childhood Education and Care (Birth-5) CRICOS Code: J TAFE Higher Education Course Number: Location: Nirimba Campus (at Quakers Hill), Western Sydney Institute Commencement: Each course may differ. 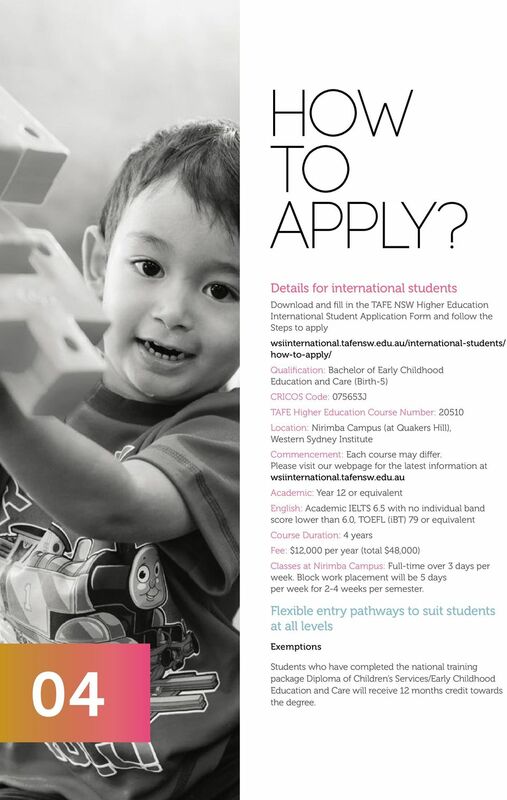 Please visit our webpage for the latest information at wsiinternational.tafensw.edu.au Academic: Year 12 or equivalent English: Academic IELTS 6.5 with no individual band score lower than 6.0, TOEFL (ibt) 79 or equivalent Course Duration: 4 years Fee: $12,000 per year (total $48,000) Classes at Nirimba Campus: Full-time over 3 days per week. Block work placement will be 5 days per week for 2-4 weeks per semester. 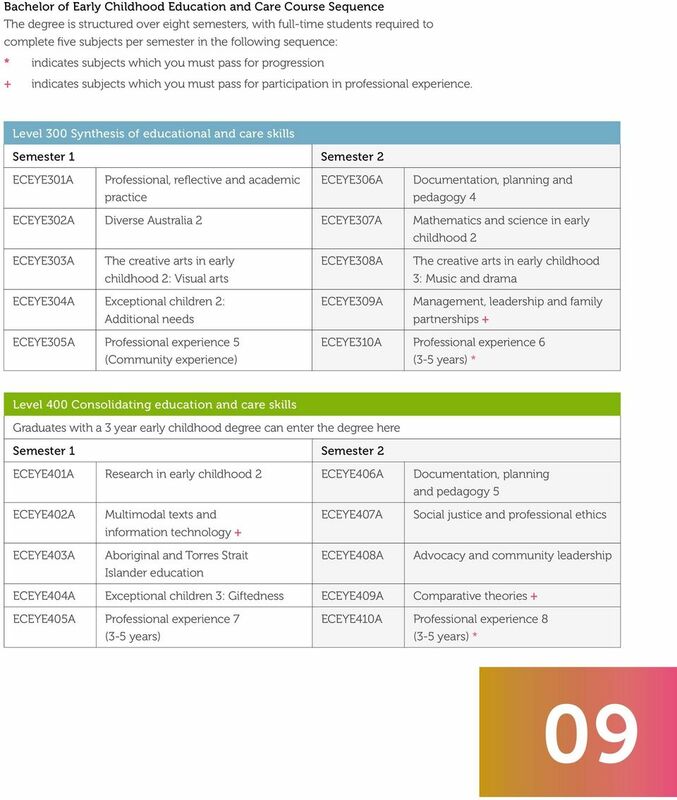 Flexible entry pathways to suit students at all levels Exemptions 04 Students who have completed the national training package Diploma of Children s Services/Early Childhood Education and Care will receive 12 months credit towards the degree. 8 What our students say Caitlin Clark Australia Currently studying Bachelor of Early Childhood Education and Care (Birth-5) Diploma of Children s Services (Early Childhood Education and Care) Esther Shui Li Fong Malaysia Currently studying 3rd year of Bachelor of Early Childhood Education and Care (Birth-5) Diploma of Children Services (Early Childhood Education and Care) I have found the teachers at TAFE to be passionate because they know how to capture your attention. I still remember stories my teachers told me early in my course and I use these to explain to other people the importance of early childhood education. I really enjoy the play sessions where we practise our skills with families and children from the community. When I came to TAFE I had never been in the work place so this experience gave me the confidence to believe that I could cope in a real work setting. I have had lots of opportunities to create work place resources and I believe these skills will help me immensely once I start my career working with children. 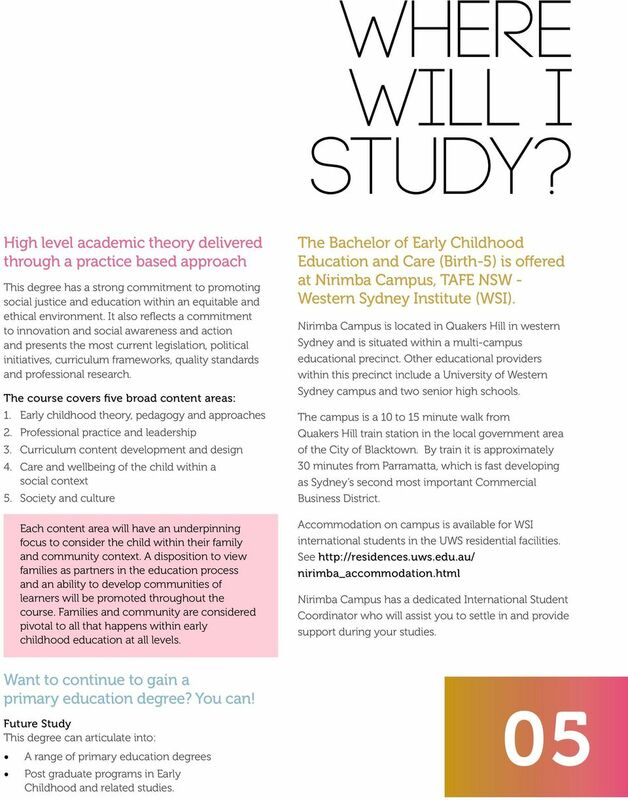 I wanted to study the Bachelor of Early Childhood Education and Care at TAFE NSW Higher Education because I like the supportive environment, real work life experiences, small class sizes and face-to-face learning offered at TAFE. 06 The reasons why I chose TAFE were because its courses allow pathways to higher education, either in universities or TAFE itself, and it provides quality teaching and learning experiences. The good thing about TAFE is that it gives the students hands-on learning and the lecturers were very helpful. It has a good reputation; I ve heard and read a lot about how successful some students were after they finished/ graduated from TAFE. 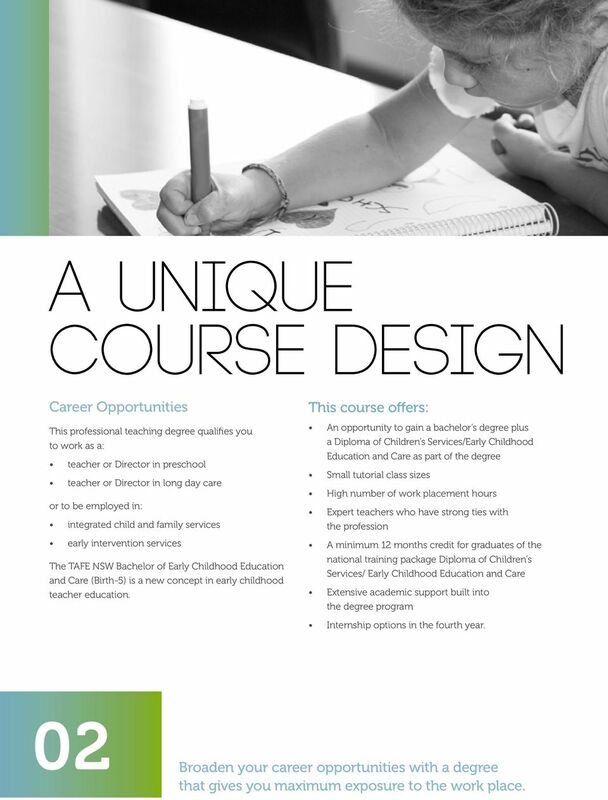 Other than that, TAFE provides courses that suit my needs and that is the reason why I chose TAFE. 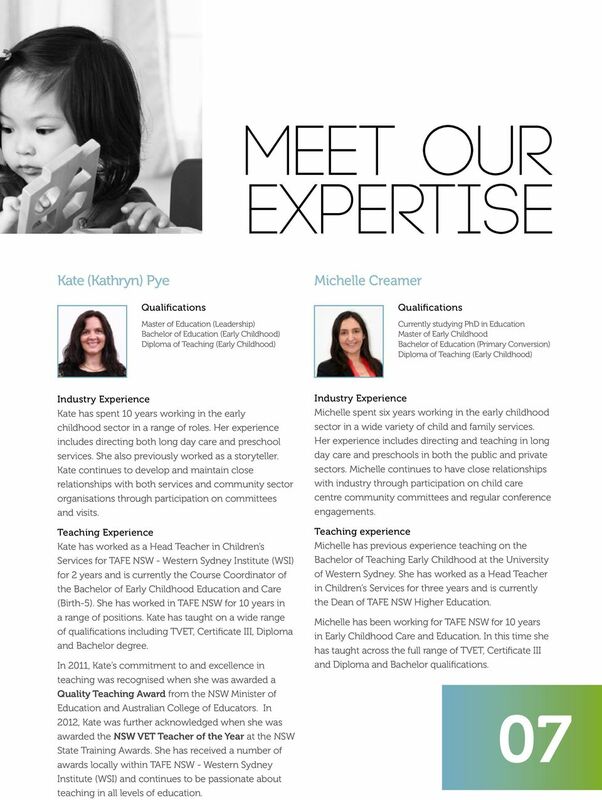 During my studies since Certificate III in Children Services, my classmates and I were sent to a range of childcare centres or preschools to have hands-on practice with what we ve learned. They were wonderful experiences and the knowledge, understanding and skills that I gained, both from my lecturers and friends came in handy whilst I was on prac. When given different centres, I had an idea on how each centre runs and their philosophy in providing quality experiences and care for both the families and children. Communicating with the staff gave me more knowledge on working with children. Esther is now putting these skills into practice in her part-time job at a child-care centre. Program aims. What s the degree about? Climb the corporate ladder? Or build your own? JCU Singapore is the first organisation with this accreditation. Why postgraduate study at ICMS? 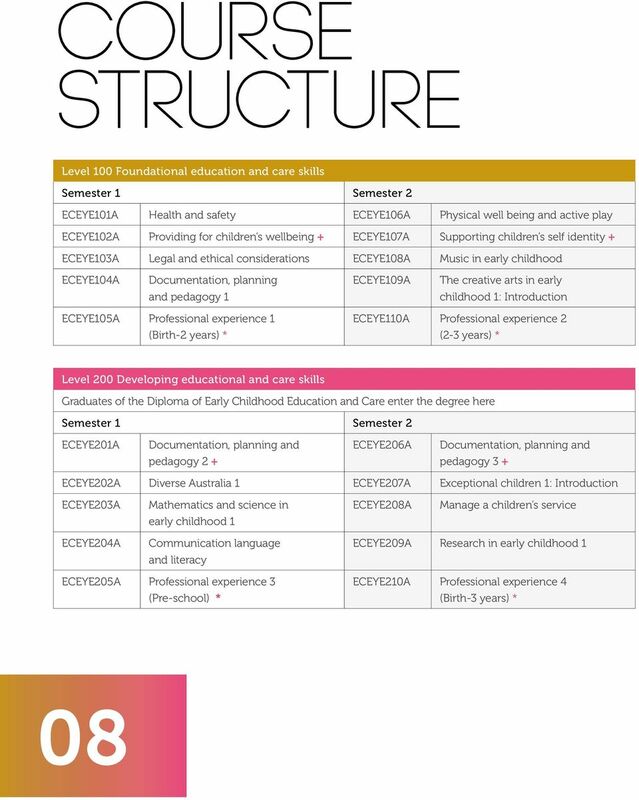 COURSE REGULATIONS SCHOOL OF EDUCATION BACHELOR OF EDUCATION (EARLY CHILDHOOD AND CARE: 0-8 YEARS) BEd(ECE) COURSE CODE: 3382 THESE COURSE REGULATIONS ARE EFFECTIVE FROM 1.1.2015 SCHOOL OF EDUCATION 1. Go higher GHER GO HI with a SW Hig N TAFE REE n DEG ucatio her Ed Go higher with a TAFE NSW Higher Education degree A TAFE NSW Higher Education qualification is a valuable tool for building your future. COMMUNITY SERVICES SOCIAL WORK inspiring achievement FLINDERS.EDU.AU 04 SOCIAL WORK AT FLINDERS 06 COMMUNITY SERVICES 08 SOCIAL WORK University should be about much more than classes, coursework and exams.